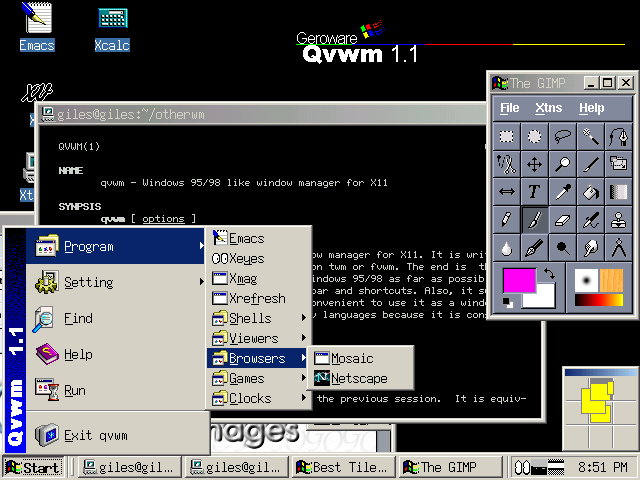 A screenshot of QVWM, showing the desktop at the top (the icons are animated! ), typical windows framing and buttons, a menu system quite similar to Windows 95, a similar taskbar, and in the lower right just above the clock, the highly non-authentic virtual desktop pager. I used 1.1.12 from June 2001. There were plans for version 2, but this seems to be the most recent version. No. It looks like Windows 95/98. What more do you want? QVWM was written from scratch in C++. The name is a wordplay: "q" looks similar to the number "9," and "V" is the Roman numeral "5." Just as in Windows, the taskbar can be towed to any side of the screen. Focus behaviour is the same as Windows, ClickToFocus. The 3x3 virtual desktop allows you to pull windows from one area to another by dragging the window to the screen edge: keep pressing the mouse against the screen edge and you'll shortly be on the next section of the virtual desktop. This behaviour is very similar to FVWM in its default configuration. Occupies only about 1.2 Meg of memory. Most people seem to prefer workspaces to the virtual desktop used here. QVWM includes deliberate dissimilarities to Windows, which seems to defeat its own stated purpose. There were mailing lists. I suspect they're dead now, although I didn't join to find out (no archive available).